The Joshua Tree is not a true tree, but a member of the Agave Family. It is the largest yucca and can grow to a height of 30 feet. The trunk grows to 3 feet in diameter and has brown or gray furrowed bark which is often covered by dead leaves on younger plants. Leaves on the many upward branching arms of the plant are dark green, long and narrow with toothed margins to 14 inches in length. The plant grows in rocky plains and hillsides at elevations between 2000-3500 feet. 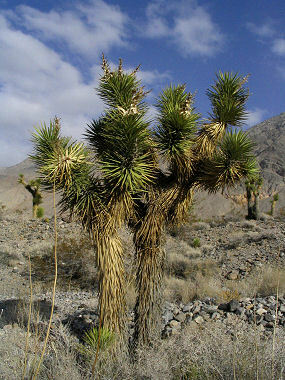 The Joshua Tree is the characteristic plant of the Mohave Desert. It was named by Mormon pioneers who thought it looked like the biblical Joshua lifting his arms in prayer. The Joshua Tree typically blooms between March and April producing greenish white, waxy, bell-shaped flowers to 2.5 inches in length which grow in clusters from stalks that grow from the ends of the branches. The plant does not bloom every year, flowers are produced only if rainfall temperature conditions are favorable. A Joshua Tree can live for 100 to 300 years.